Update 2016: New data shows a meteor impact likely caused the Permian Extinction. Hyper-volcanism may have played a pivotal part in great extinctions even of the dinosaurs. The Siberian Traps form a large region of volcanic rock, known as a large igneous province, in the Russian region of Siberia. The massive eruptive event which formed the traps, one of the largest known volcanic events of the last 500 million years of Earth's geological history, continued for a million years and spanned the Permian-Triassic boundary, about 251 to 250 million years ago. The term "traps" is derived from the Swedish word for stairs (trappa, or sometimes trapp), referring to the step-like hills forming the landscape of the region, which is typical of flood basalts. Vast volumes of basaltic lava paved over a large expanse of primeval Siberia in a flood basalt event. Today the area covered roughly equal to western Europe in land area. This was a super volcano on an unimaginable scale. This would have poisoned both the atmosphere and to some degree the oceans. This massive eruptive event spanned the Permian-Triassic boundary is cited as a possible cause of the Permian-Triassic extinction event. This extinction event, also called the Great Dying, affected all life on Earth, and is estimated to have killed 96 percent of species living at the time. Life on land took at least 30 million years to fully recover from the environmental disruptions which may have been caused by the eruptions. It is the only known mass extinction of insects. Researchers have variously suggested that there were from one to three distinct pulses, or phases, of extinction. There are several proposed mechanisms for the extinctions; the earlier phase was likely due to gradual environmental change, while the latter phase has been argued to be due to a catastrophic event. Suggested mechanisms for the latter include large meteor impacts, increased volcanism, coal/gas fires and explosions from the Siberian Traps, and sudden release of methane (ice-hydrate) from the sea floor; gradual changes include sea-level change, anoxia (the Earth's oceans become completely depleted of oxygen), increasing aridity, and a shift in ocean circulation driven by geological and climate change. 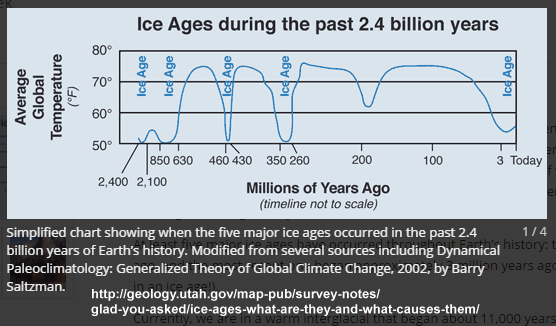 Climate change is a normal part of the earth's geology and is what drives evolution. A similar event in the Dekken Traps (India) may have already been killing off the dinosaurs even before the asteroid impact off the Yucatan in Mexico 65 million years ago. The asteroid merely finished what volcanism had already started.